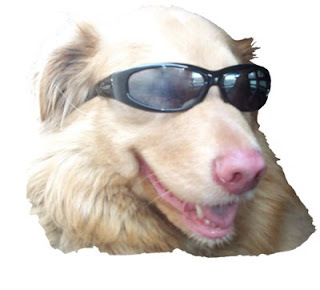 For the past five years Maxxamillion has used a picture of himself wearing dark sun glasses for his Coolest Dog On The Planet.net website and his Squidoo profile. Maxxamillion always loves to have his picture taken. Although in recent years we feel like he is snubbing us. We have noticed he turns his face to the right or left just before the snap of the camera. We feel all dogs are the coolest on the planet. This is Maxxamillion's favorite weather time of the year. The brisk cold air makes him more playful and spunkier than usual. 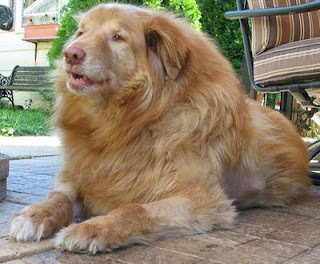 We love seeing him on the patio enjoying the cold breeze. But it's also at this time of the year that he pretends he doesn't hear us calling his name when it's time come inside for the night. He ignores us and turns his head, continuing to enjoy the cold brisk air. We just smile and even laugh because we know he hears us and understands that it's time to come in, but he just wants a little more time. So again we smile and give in, letting him stay out just a little while longer. Oh how we love Maxxamillion. It doesn’t matter if you have already decided to purchase health insurance for the family pet or if you are simply shopping for one. When you are comparing the quote of one health insurance quote to another, remember that the base dollar amount is not the only number you have to consider. In addition to the monthly payment, make sure you also check out exactly what type of veterinary care and treatments are covered (some basic insurance plans do not include cancer treatment), what kind of deductible you, the pet owner, will be expected to pay, is there a yearly cap on medical expenses, and what type of discounts are available. At the moment there are only a handful of companies that offer pet health insurance.